This Christmas Eve, we continued our yearly tradition based loosely on the Italian Feast of the Seven Fishes. We don't worry about the exact number of fishes, and we don't limit ourselves to Italian dishes. We just use the holiday as an inspiration to create a multi-course meal centered around fish and shellfish. We had no real unifying theme this year. Our initial thoughts revolved around a "Mediterranean (both sides)" idea, but we ended up throwing in a bit of the new world as well. Our Christmas Eve feasts have always started out with oysters, and we weren't about to change that this year. This guy is a local Olympia oyster, grown by Carlsbad Aqua Farm and purchased from Bay Park Fish Company. The sauce was made from chile de arbol - whole dried chiles, soaked and then blended with garlic, cilantro and a bit of red wine vinegar. 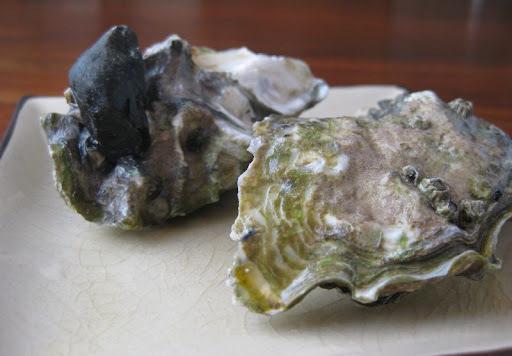 The flavor of the oyster was clean and briny, and went well with the hot punch from the chile de arbol. In addition to the Olympia oysters, we also had some Conway Cup and St. Simon oysters for good measure. 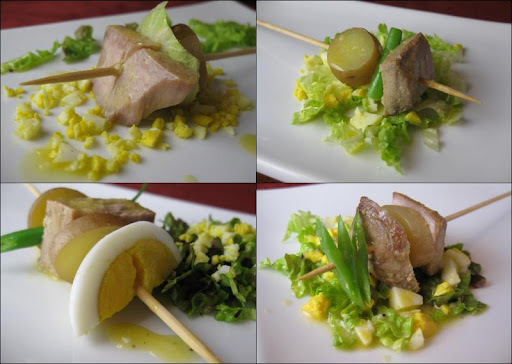 Kind of a play on a Niçoise Salad. The tuna (Ahi) was salted and then poached confit-style in olive oil that was flavored with garlic, bay leaf and peppercorns. 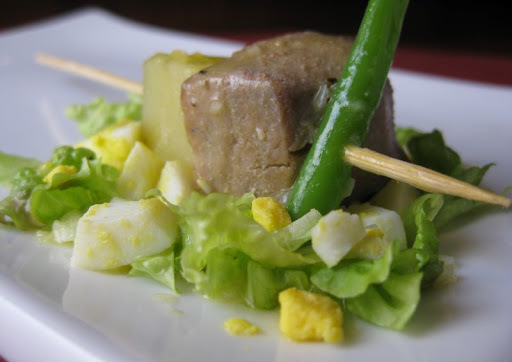 We skewered it with potato and green bean, served it over a bed of lettuce and chopped egg and sauced everything with a vinaigrette. The tuna had fantastic flavor all by itself, and was made even better by the other ingredients. The vinaigrette consisted of oil, white wine vinegar, lemon, Dijon mustard, anchovy and minced shallot and garlic. We don't often make emulsified dressings, but we really enjoyed this one and found ourselves scraping every last morsel of salad from the plate. Cutting them up seemed the only sensible way to serve them (although we did sear them whole). 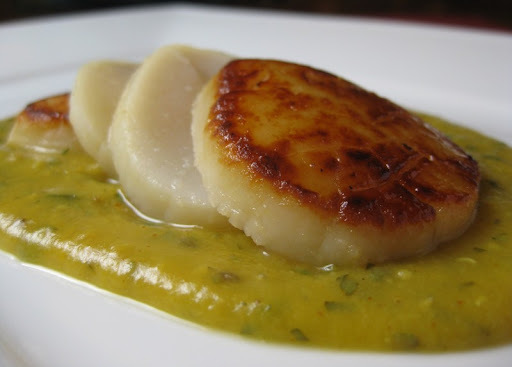 The bright-yellow base underneath the scallop is a hugely aromatic and tasty mixture of red lentils and yellow split peas we often use with fish (you can find the recipe here). The flavoring is turmeric, cumin, ginger, lemon and cilantro. This year's way of getting maximum fishes out of a reasonable number of dishes. The fish were shrimp, squid, asari clams, rock cod and lingcod. Some green beans and piquillo peppers rounded out the mix. 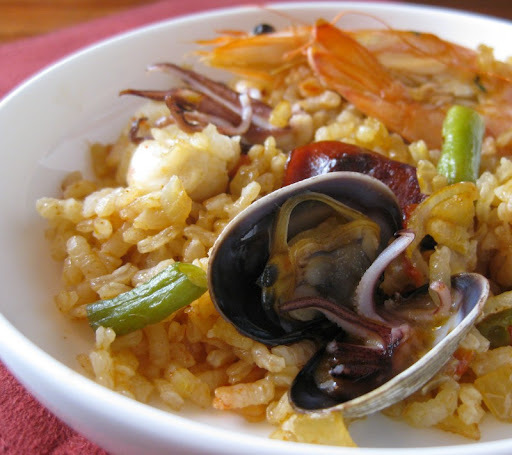 We initially under-measured the amount water in the rice which resulted in a longer than ideal cooking time for the seafood. Despite the mishap, it came out looking beautiful and tasting great. 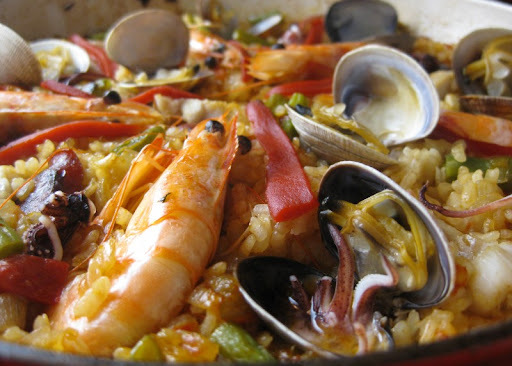 It was the first time we've made a seafood paella, but it certainly won't be the last. So ends another fun, if a bit exhausting, "seven" fish feast. The final tally for this this year was 4 dishes and 8 fishes (10, if you count the varieties of oysters separately). 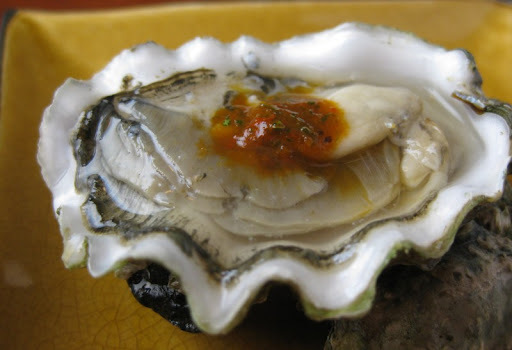 2008 Feast of the Seven Fishes - Oysters with Vietnamese Ginger-Chili Mignonette. Cured Salmon Four Ways. Thai Steamed Mussels. Vietnamese Salad with Smoked Trout and Bitter Greens. Ginger Fish. Squid in Caramel Sauce. Napa Cabbage Soup with Shrimp Dumplings. 2007 Feast of the Seven Fishes - Oysters with a Thai mignonette. Crispy Fish and Lentil Balls. Sardines on Toast. Yucatecan Squid Salad. Fish and Shellfish Stew. A stunning array of seafood...I'm speechless. The paella really is the show-stopper. Peter - yep, and the best thing about paella is how easy it is once you get the technique down. that really is quite a feast. 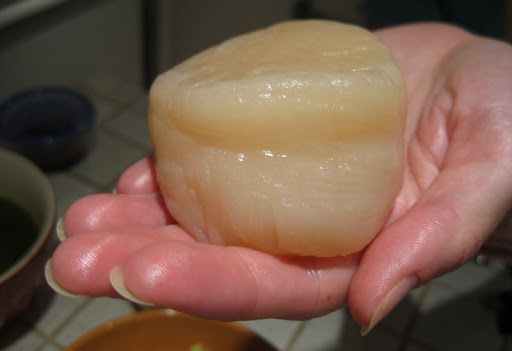 and good lord that scallop is terrifyingly MONSTROUS! 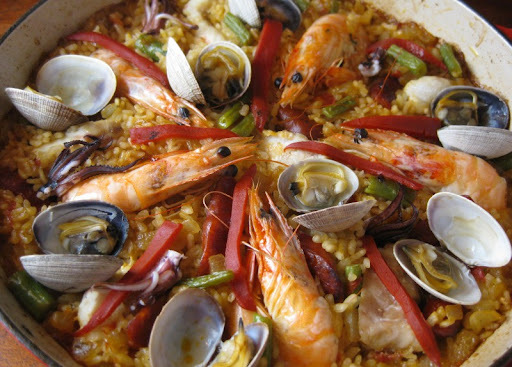 and i have yet to try out paella...looks really beautiful though. Hi Sawyer - Happy new year to you as well! 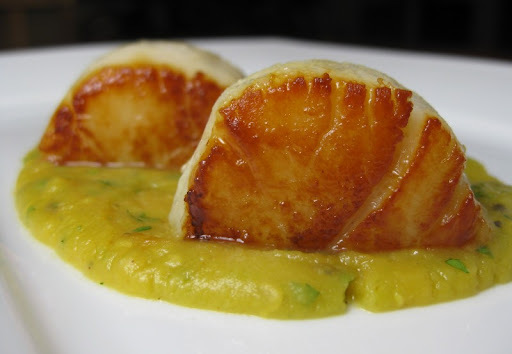 That scallop has elephantitis! It must've been like $20 for that one scallop ha! I love the way you presented the scallop dish, beautiful. e d b m - Thanks - they were pretty massive scallops, but only about $5 each (around a quarter pound each at $20/lb).